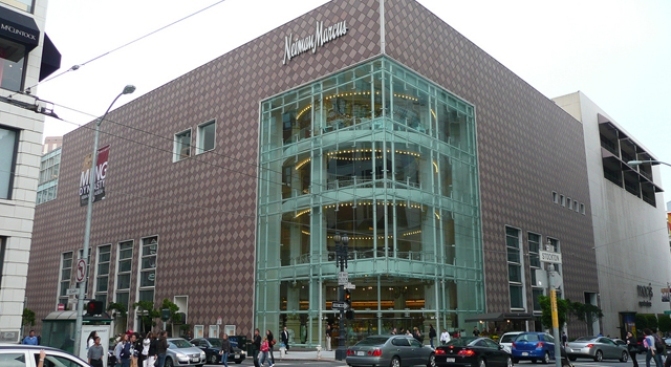 The outside of the Neiman Marcus in San Francisco. It soon will have a sister store in Walnut Creek, Calif.
Walnut Creek NIMBYs and their deep pocketed friends were overwhelmingly silenced Tuesday by voters who finally rolled out the welcome mat for Neiman Marcus. The controversial Measure I was approved by 71 percent of voters. The move clears the path for the high-end retailer to build 92,000-square-foot store in Walnut Creek's Broadway Plaza. By saying "yes" to Measure I, voters also ended a well funded campaign to sabotage the Neiman Marcus move to Walnut Creek by a rival mall, who was rumored to want to entice the store down the 680 to one of its own, soon to be constructed, shopping centers in San Ramon. Real estate giant Taubman Centers, which owns and operated Sunvalley Mall in Concord,Calif., spent a reported $687,000 to defeat the measure. The group hid behind a group of residents and former Walnut Creek politicians who opposed the store mainly because of traffic concerns. But NIMBYs weren't the only ones with a sugar momma. Macerich Co., who operates Broadway Plaza, spent spent $1.3 million to push the measure through. With close to $2 million being spent just to hold a debate about the store, no wonder Neiman Marcus wants to open in Walnut Creek.